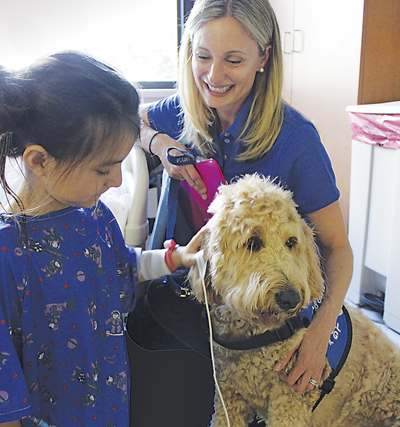 Goldendoodle Elsa is a rock star at VCU Medical Center, even though there’s no red carpet underneath her paws. The calm-natured, 55-pound sandy blonde fluffball strolls alongside her handler, Margaret Popik, down the halls of the pediatric inpatient unit at Children’s Hospital of Richmond at VCU. Along the way, doctors and nurses, as well as kids and parents, make their way over to Elsa to get their doggie fix for the day. Elsa is happy to oblige, posing for photos and sitting for a pat on the head or a hug. Elsa and Popik are volunteers in VCU Health’s Dogs On Call Therapy Dog Program, part of the Center for Human-Animal Interaction. 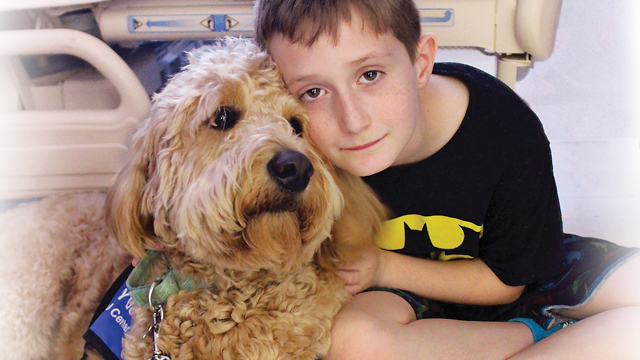 The program helps enhance the well-being of patients, staff, and students through canine-assisted interventions. 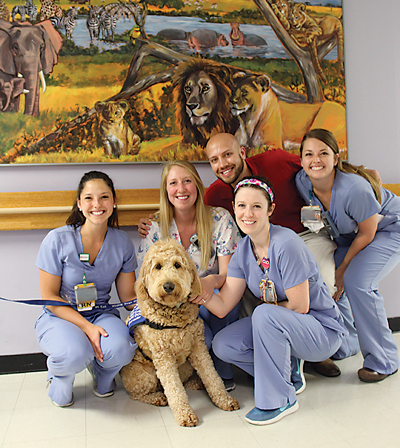 Elsa is surrounded by human members of her fan club – staffers from Children’s Hospital of Richmond at VCU – who appreciate the benefits of animal interaction for patients. Dogs On Call teams visit in most areas of the VCU Medical Centers, including Children’s Hospital of Richmond at VCU and Stony Point clinics. Popik could see the spark in Savannah’s eye when Elsa came to the door. “To see [patients] visibly relax and smile is when the magic happens. Sometimes you see tears in the eyes of the parents. These are subtle cues that we are making a difference. If that happens, it really does impact the child, and that is the whole reason I do it,” she says. For children and their families, time spent with a therapy dog like Elsa can help alleviate stress during a traumatic experience. Around that same time, Popik and her family got a new puppy, and as a stay-at-home mom with former experience as a school psychologist, she knew she wanted to help make a difference in the lives of people who were hurting. Established in the VCU School of Medicine in June 2001 and housed in the Department of Psychiatry, the Center for Human-Animal Interaction is involved in research, clinical, and educational activities related to the human-animal relationship. Through animal-assisted intervention like DOC, they hope to improve the health and well-being of patients and members of the community and to understand the benefits this type of intervention brings. Janie and Al Robertson visit VCU and UR with their therapy dogs and help college students de-stress during exams. Currently, DOC has ninety-five therapy dog teams. “Some of the teams are our own medical staff, some are medical students, but most are community volunteers,” Dr. Barker says. Medical students can enroll in an elective during their senior year to learn about the center. They can also participate in collecting survey data from patients. He spent last year studying the clinical side of medicine. Dr. Barker has co-authored several studies with other healthcare professionals that recognize the value of therapy dog interventions in reducing stress. “We have been collecting patient satisfaction data, and it’s been amazing. We have had over 350 patients respond,” she says. 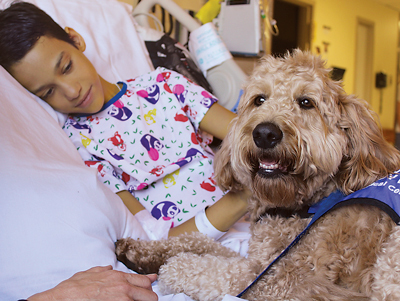 Therapy dogs aren’t just helpful in the hospital. Dr. Barker co-authored a 2016 randomized study regarding the effect of visiting therapy dogs on college students’ stress before final exams. The visits were extremely popular with students facing academic stress. Margaret Popik and Elsa, volunteers with Dogs on Call, visit patients in most VCU Medical Center buildings and some off-site locations. Two other studies she co-authored followed dogs in a workplace setting and in interactions with healthcare professionals. The first study compared employees who bring their dogs to work, employees who don’t bring their dogs to work, and employees without pets. The overall findings: Workers who had their dogs at work had lower stress than dog owners with dogs at home or employees without pets. The evidence-based DOC program has proven to be an effective intervention for anxiety, fear, and stress in patients and staff. “We know the dogs make a difference in our patients’ lives, our staff’s lives, and students’ lives,” she says. The DOC program has had all different types of dogs, everything from American Kennel Club champions to mixed breeds. “First, the dogs have to be registered with either Pet Partners or the Alliance of Therapy Dogs,” says Dr. Barker. Popik and Elsa started basic obedience classes when Elsa was twelve weeks old and continued for about a year. Most of that work focused on “reinforcing good manners, making sure consistent boundaries were established, strengthening impulse control, and making sure she felt safe and secure with me as her handler,” Popik says. The dogs are trained and socialized if they pass the initial test, and Dr. Barker says they monitor the teams and observe them on an annual basis to make sure everything is up to snuff. 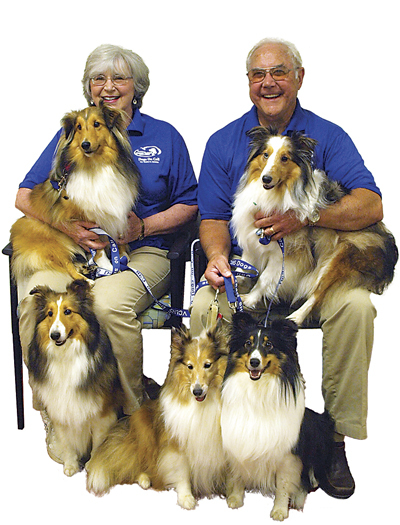 Janie and Al Robertson have seven therapy dogs of their own and are testers with the Alliance of Therapy Dogs. They also teach therapy prep classes at Richmond Dog Obedience Club. “We are very passionate about therapy dogs,” Janie says. Ready for duty! 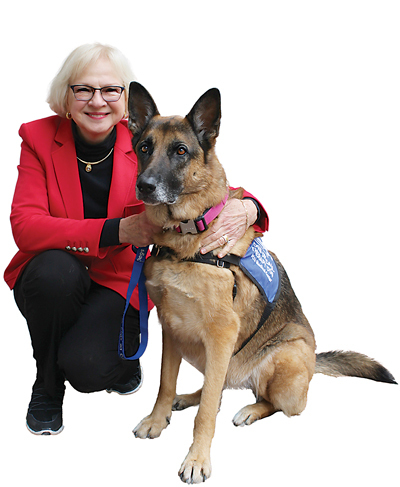 Dr. Sandra Barker, professor of psychiatry and director of the Center for Human-Animal Interaction, and Dahlia. Additionally, they visit certain businesses so the dogs can spend time with employees who can pet them and “love on them,” she says. Kim Wright, a volunteer handler with Dogs On Call, has two therapy dogs – Clark and Callie – who are both goldendoodles, and very different souls as well. Clark is more stoic than Callie. “Callie is my smiley girl,” Wright says. Previous articleTry Out an Underdog City! Next articleWhy “Great Job!” Isn’t What Kids Need to Hear!